Hernando "Scratch" Gomez doesn't need his Ferrari 348 Targa anymore now that he's in an American jail because of his nasty drug trafficking habit. 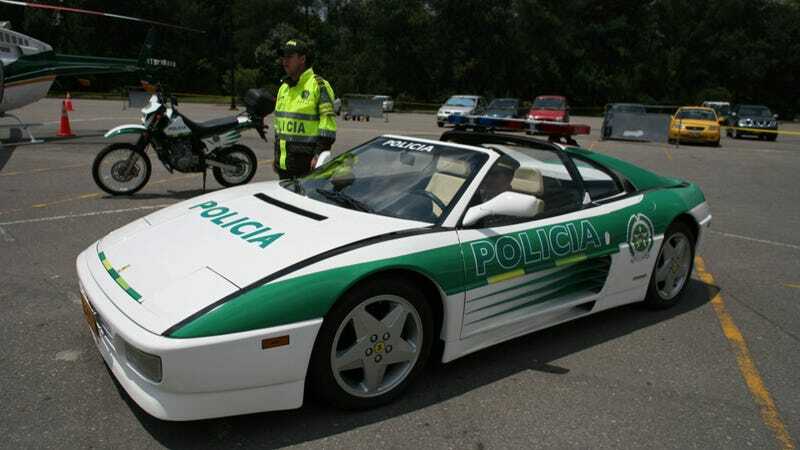 The authorities back in Bogota, Colombia thought they'd do what American cops tend to do with their drug-seized cars and converted it into police cruiser. National police in Colombia have a tough beat. Do a stand-up job fighting the drug cartels and you risk getting bumped off. Do a bad job and you risk getting a big fat bribe. Somehow a convertible Ferrari seems to make the former easier and the latter seem like it already happened.